Caster born in Italy in 1976. Along with “Acciaierie Valbruna” facilities, from raw materials to metallurgical and science laboratories were available. Five basic alloy magnetic-drive Sealless pump models were designed and developed simultaneously, including centrifugal and regenerative turbine and thermoplastics, along with vane pumps. Machining from solid block, slab and bar was selected over casting and injection moulding whenever feasible. Additional four basic designs quickly followed including alloy and thermoplastic self-priming centrifugal, self-priming thermoplastic regenerative turbine and thermoplastic sliding vane positive displacement models. 1985 Caster design and develop oscillating piston pump for high viscosity. 1988 First double stage pump was designed and installed. First stage centrifugal impeller, second stage regenerative turbine impeller. 1988 Design and developed barrel centrifugal multistage pump. First multistage pump barrel, magnetically driven. 2000 Sundyne Corporation acquired Caster facility in Italy. 2005 Production is moved from Italy to England into HMD/Kontro (a company of Sundyne corporation group) facilities. 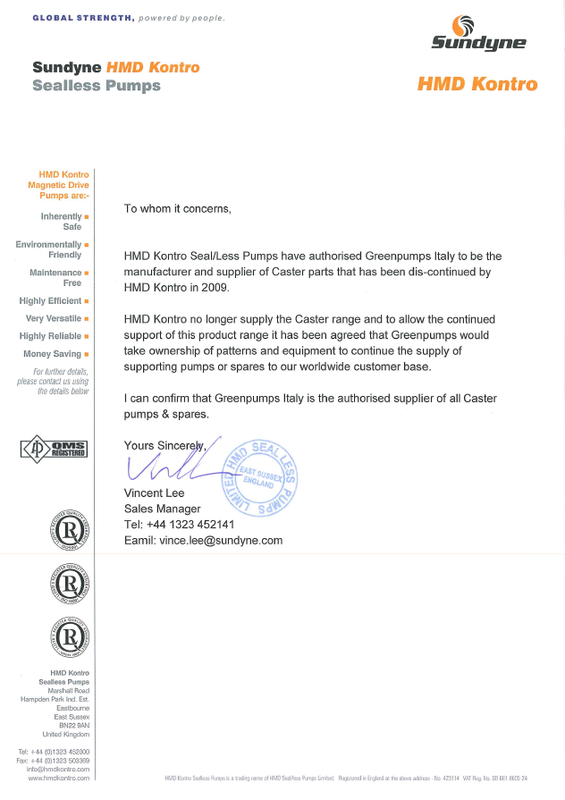 2009 ownership production and distribution of Caster product and relevant spare parts, is officially given from HMD/Kontro to Greenpumps srl.